Second teaser featuring our shooter. That shooter looks really awesome! Once again, the sheet metal work is awesome and I really like those wheels. Great job! 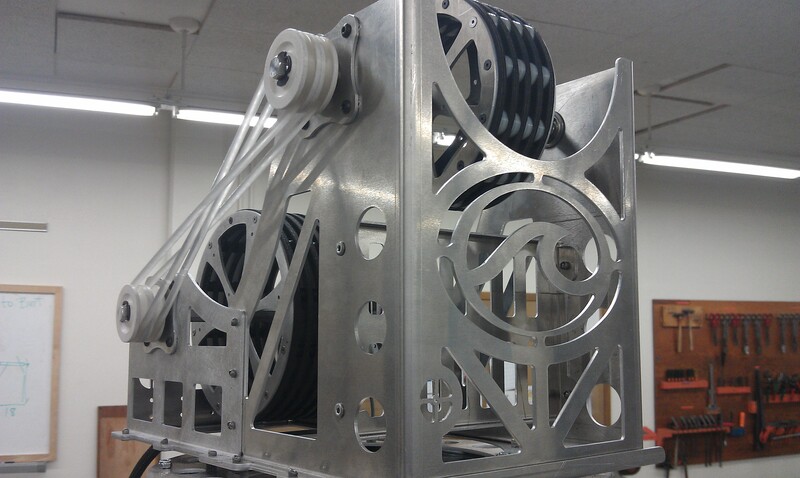 What motors do you have running the flywheels? It’s too bad Wisconsin and Midwest are at the same time this year, would love to see the final product in person. Looks incredible. Hopefully we will see you in St. Louis. Looks like we got beat in the style (and probably functionality) department. Again. But besides that, I’m curious to know how you guys are going to avoid dead zones at the bottom of the turret because, from what I can see the geometry looks really close to having one. iconic “Wave-jetted” pieces suitable for a car show. We are running 4 RS775 into one gearbox. Whoa! It better spin up fast. Also, I really like the different sized wheels to give it spin. I think it’s a better solution than running some at less than full power. This is SOOOOO AWESOME… On a side note… Waterjet? For the figure-8 polycord wrap, are you doing anything special to limit/prevent the belt from rubbing against itself? Close, we laser 90% of our metal, we do have access to water jet but its faster for us to laser. I really like that polychord wrap! To get the same effect in our ball intake system, my team went with a chain path that looks a bit like the star trek logo. Your design looks like it is a simpler and better solution. From other content that i have seen of your robot, it looks like you have a wide tower (using polycord) that funnels the balls near the top as they enter the shooter. What I am really curious about is how you pick up balls from the ground (if you do) and how well your taller robot goes over the bump, as far as tippiness goes. Overall 2826’s robot looks similar to 1716’s, and we are excited to see you at the Wisconsin Regional this year. BTW, will 2826 be at the Sussex Mini Regional this year? We will. We should put more fancy curves on our design next year! Wave: Your shooter looks pretty good, do you have the ability to apply backspin to the ball? From other content that i have seen of your robot, it looks like you have a wide tower (using polycord) that funnels the balls near the top as they enter the shooter. What I am really curious about is how you pick up balls from the ground (if you do) and how well your taller robot goes over the bump, as far as tippiness goes. I think we have seen the same content and I have same questions. I’m guessing they will have a drop down ball collector or be human loaded (kinda similar to 254 in 2006). If its the later, I hope you plan to shoot from the human player station, as that would be epic! Whatever you plan to do, I’m sure it will be effective. Looks outstanding - I’m really looking forward to seeing you guys at Wisconsin! It seems like these guys have been building clean, unique machines since their rookie year. It was great stopping by to talk you guys in St. Louis last year. Keep up the good work, looking forward to seeing the completed robot. Good luck this year. I look forward to 2826’s machines every year. They’re always as beautiful as they are capable. We have not had any issues with this yet. Yes it is close and is designed to be. We were covering new ground on this one, and it seems to be able to both speed up and down (which is much harder) at a relatively fast speed for what we need. We considered this, but were able to run the shooter for an extended period of time and the poly-cord got warm but nothing dangerous. Our plan is to figure out where the half-life of the poly-cord is and replace it when it gets to that approximate state. 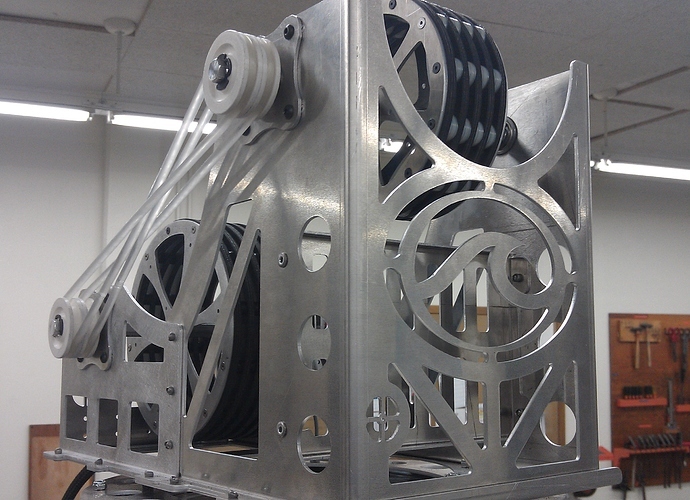 We do not need to worry about the poly-cord stretching a little as we will use encoders to track RPM. I think we have seen the same content and I have same questions. **I’m guessing they will have a drop down ball collector **or be human loaded (kinda similar to 254 in 2006). If its the later, I hope you plan to shoot from the human player station, as that would be epic! Whatever you plan to do, I’m sure it will be effective. Why not do both? I am worried about the projector in the middle of the field though…if anybody knows the height of this, I would definitely appreciate the info. Travis, I look forward to seeing you and 48 at Wisconsin! Nick and Justin: Thank you for the compliments, we are very fortunate to have a great sponsor to laser cut and provide all of our sheet metal. If you look at our robot from our rookie year, we have definitely taken steps in the right aesthetic direction IMHO. Wave is planning on going to the Sussex Invitational this year as well. I am worried about the projector in the middle of the field though…if anybody knows the height of this, I would definitely appreciate the info. I dont know the height of the projector, but I do know that last year our human player hit the projector with a tube.